NEW! Keep Singing Feather Legging! Check out the only pair of leggings that you'll ever need to own! "Keep singing" is a message of hope for all of us trying to help, and to all of the animals that humans mercilessly exploit through factory farming, food production, clear-cutting, laboratory experiments, entertainment, or the fashion industry. We will keep singing for their freedom. We will not be silenced! 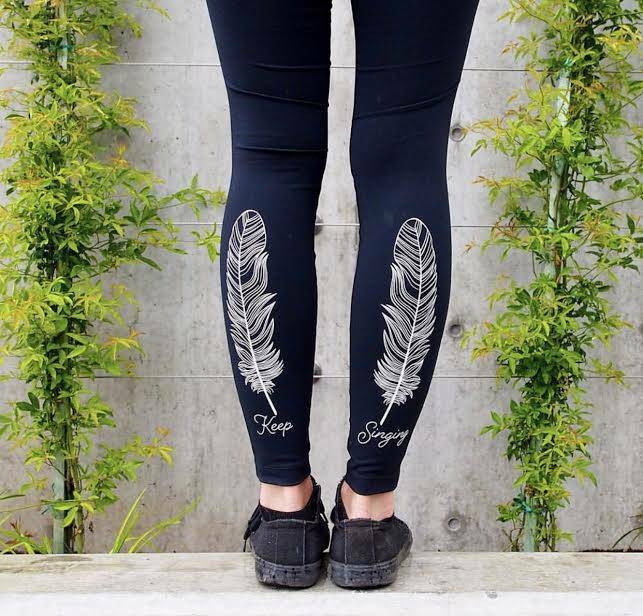 Not only are our Keep Singing Feather Leggings a gorgeous symbol of our commitment to the ethical treatment of animals, they are also made to last, using Anti-microbial Stretchflex technology to provide lasting recovery and a great fit. Whether you're jogging to the dog park, doing your sunrise salutation, or participating in local activism, these leggings will be with you on the journey. Check out our new legging below and remember to KEEP SINGING! Even if your voice wavers. Because we are the voices for the voiceless, and our voices together can make a difference.